On Sale Now! Free Shipping Included! 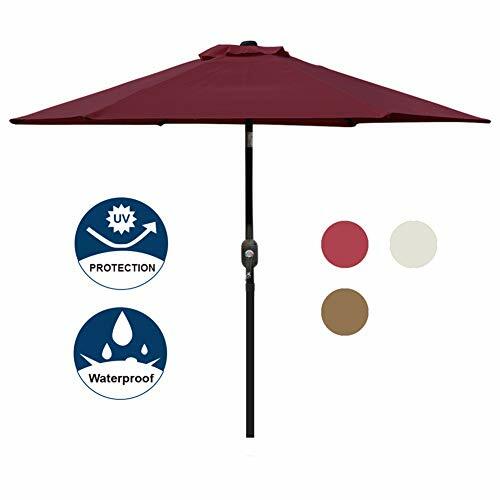 Save 8% on the Blissun 7.5 ft Patio Umbrella, Yard Umbrella Push Button Tilt Crank(Red) by Blissun at Go Plots. MPN: 4336584295. Hurry! Limited time offer. Offer valid only while supplies last. 100% Fabric polyester, waterproof, 98% UV protection, high-quality material can be used for many years. Air vented canopy at the top designed for air flow and prevent from inversion. Rust- Free Powder Coated Aluminum Pole and Steel Ribs provides superior strength support that resists wind better. Umbrella base is NOT included. Purchase the matching umbrella base by searching B07B62X7VC, B07B5WD1WV. NOTE: ① Due to monitor variations, colors may appear slightly different. ② Close the umbrella during windy days for longer use. If you have any questions about this product by Blissun, contact us by completing and submitting the form below. If you are looking for a specif part number, please include it with your message.